Do you have unwanted bushels just piling up the space of your Market Stall and don’t know what to do with it? 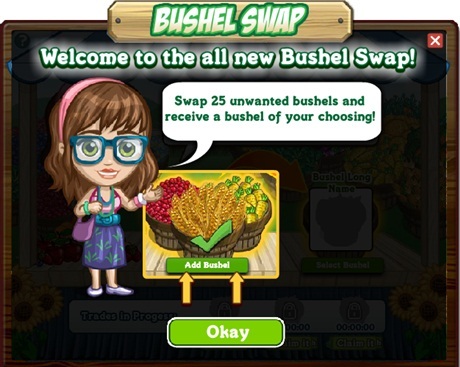 Here comes FarmVille Bushel Swap feature which will be release soon. This new feature looks promising doesn’t it? 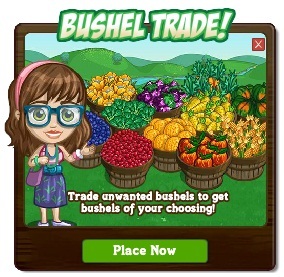 because you can now trade those unwanted bushels for a bushel of your choice. So if you are in need of 2 or three more bushel to finally craft those quest requirements this feature will certainly help. But in order to this of course there’s a catch. 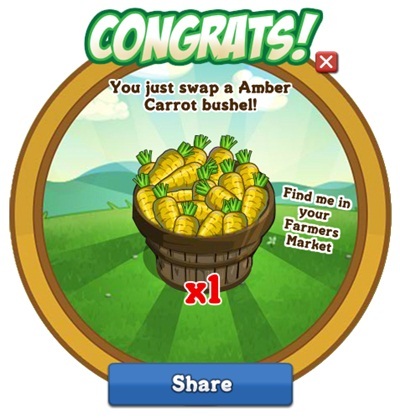 The catch is in order to swap for 1 bushel that you wanted you’ll need to trade 25 of unwated bushel for it. Which means the ratio will 1 : 25. It is also not an instant trade or swap. You’ll have to wait several hours for the trade to kick in. But “still” finally you don’t have to remove those unwanted bushels to make room, you can finally trade and make use of it in exchange for those you’ll need. 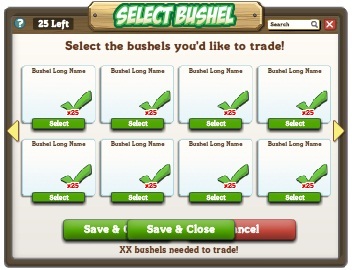 With my market stall maxed out sometimes at 1100 and I think of how many bushels of Leaderboard Limited Edition crops I simply throw away, this might be useful. Not a very fair exchange, but better than nothing. It’s a pity that they can’t organise it so that neighbours could trade bushels directly. I’m enjoying it – I’m actually running out of bushels to throw away. I’ve planted some super aloe to get bushels to trade in. I’m liking the bushel swap as well. I’m finally not always maxed out in my stall and it’s ok that it gave me 150 bushels for the super pink roses. I’m down to 50 now with swapping 3 at a time. Fairer for many, especially newer players who haven’t maxed out at 1100, now that the swap has reduced from 25:1 to 10:1, but not so easy to get rid of excesses!